When I first learned to bird, the American Kestrel was called the Sparrow Hawk. This colorful little hawk is the only bird of prey one might refer to as cute. The male has blue-gray wings and a rufous tail. There is a rufous wash over its back and chest. Female hovering over the mesa. It was a windy day. Above you see a female American Kestrel hovering over a field. It was windy and she made the most of it. Hovering is not American Kestrels' main hunting technique. Nearby was a male in a grove of trees. This is typical of the type of habitat you will find male and female American Kestrels in. Male American Kestrel devouring a Jerusalem Cricket. American Kestrels eat anything small--insects like the one above, amphibians, reptiles, small mammals, and even small birds and other birds' chicks. They are in turn hunted by Golden Eagles, Red-tailed Hawks, and other raptors and predators. However, these little hawks are no powder puffs. They fight back and can chase a larger predator right out of their territory. On the lookout for a meal. Male and females share territories during breeding season. Both the male and female have bare patches of skin during the breeding season that are called "brooding patches." These bare spots of skin keep the eggs warmer than feathers alone. Male scanning his territory. Notice the black mustache marks on its face. American Kestrels nest in tree cavities or any place else that suggests a cavity such as a nest box, or a similar hole in a building. Nesting boxes for American Kestrels are successful as long as they are placed in an appropriate habitat. Female checking out the bluff. They make a very loud noise variously described as "klee-klee-klee," or "kili kili kili," or "killy killy killy." 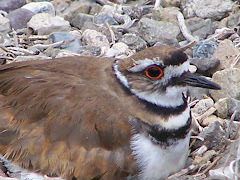 It sounds very like a Killdeer, but slightly more hawkish. On the bluff in a grove a trees, he went big bug hunting. American Kestrels are very cute. They kind of remind me of little kids dressed up like cowboys or soldiers. They kind of look tough, but you have to smile. You Tube Video of a Kestrel in flight and hovering. 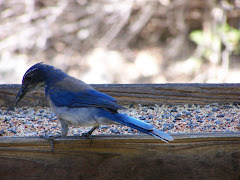 Birding in Orange County is such fun because there are so many great places to bird. So when you are out birding at Bolsa Chica Ecological Reserve, check out the signposts and trees and the cacti for American Kestrels. 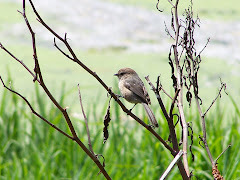 You can also see them at Upper Newport Bay, Harriet Wieder Park in Huntington Beach and other places with large fields or bluffs and perches. So go birding in Orange County. See if you can spot this cute little hawk. Nice You Tube Video with information and photos. Music, too. Often in the trees in Shipley Nature Center in Huntington Central Park. This is a really great place to go birding in Orange County and one you where you have a good chance of seeing an American Kestrel. This is one of the best birding places in Orange County and one where I have seen American Kestrels often on branches in trees, signposts, and fences. 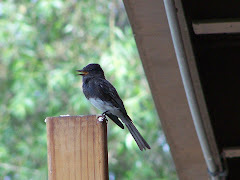 Basically, look for this bird on places it can perch and look for prey. Another Orange County Birding Hotspot, and one where you may see the American Kestel. 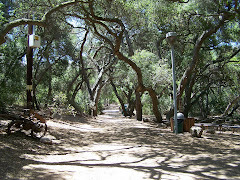 Still another great place to go birding in Orange County. I have seen American Kestrels here many times. Look for trees where they can perch and watch the area for prey. 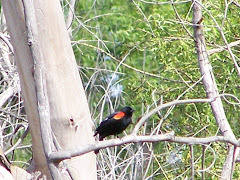 I have seen them near the Back Bay road and know they are also seen in trees near the Muth Interpretive Center at the Upper Newport Bay Ecological Reserve. Good, detailed article about American Kestrels. Very detailed article from the University of Michigan. Good information from this University of Michigan site. High quality videos of American Kestrels--includes several of dark and of light morphs. Great organization. If you are an Orange County birder who likes raptors, check out this great birds of prey center.